The super light but potentialy troublesome element magnesium is making a comeback on new welded tubular Segal frames from the Netherlands. Magnesium has the advantage of being lighter than aluminium in absolute terms but anyone who remembers their GCSE chemistry lessons will know how plain feisty the reactive material is with oxygen. The clever part, according to its boss Mark Wemmenhove is to alloy the pure magnesium with other materials to make it more corrosion resistant and furthermore well-behaved enough to be drawn into the kind of tube diameters that can be welded into a bicycle frame. 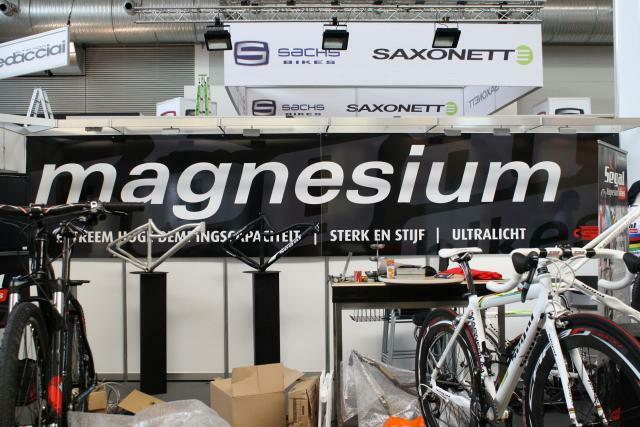 Naturally, we asked what Segal was using to improve the performance of magnesium for making bike frames "Ah ha," replied Wennenhove, "I can tell you that the other elements account for 2% of the total mass but what they are is proprietary, it's our secret." A more conventional colour scheme but the same secret magnesium blend under the paint. Fair enough, but he did say that improved as the performance is for strength, stiffness and weldability, the Segal magnesium is still subject to corrosion if it's not coated properly. He showed us a white-painted frame akin to a welded GT frame of about two or three years ago, large puddle welds and all which has a certain butch appeal. But the frame that had first arrested our progress down the aisle was what looked like an anodised green model but which actually turned out to be lacquer in an emerald shade that even an loyal Irishman would have found a bit lairy; we loved it. Weight is a claimed 1,020 grams which is comparable if not a little lighter if we remember rightly to a Cannondale CAAD 10 frame and the price is €1,600 which is pricey by the standards of a good but heavier aluminium Kinesis frame but a bargain against a whole host of frankly rather generic-looking carbon-fibre frames that are hardly any lighter if at all. The proof of the pudding, of course, will be how the new Segals ride but at this stage we have carried out no testing other than the bikie's cliché lift and appreciative 'Mmm' but you you can be sure we're looking forward to it. In theory at least magnesium is close enough in its metallurgy to aluminium for us to anticipate no particular shocks in that department bearing in mind the benchmarks like that Cannondale CAAD 10 Segal's engineers have to measure against. 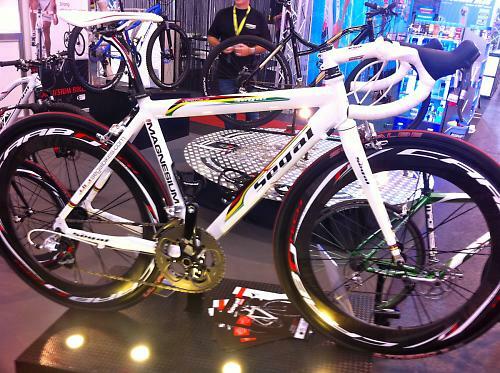 Of course, magnesium is not a new material for building bicycle frames. Back in the late 1980s a British engineer, Frank Kirk who worked for Ford in Essex, collaborated with Norsk Hydro which in turn owned an enormous capacity for producing electricity along with access in Norway to the sea-water from which magnesium is produced by electrolysis, on the production of the Kirk Precision frame, a product that caught the imagination of the cycling world at the time. The problem was that the excitement ran ahead of the actual execution of the innovative flash casting process and the initial production was fraught with difficulties. In short, parts like brake bridges and shifter bosses fell off despite some impressive demonstrations of the inherent strength of the basic frames by driving cars over them. Like many products slightly ahead of their time, the money and patience ran out before the bugs could be ironed out and the world moved on. What hasn't changed is that copious amounts of electricity production has to be used for something when people aren't brewing tea or running baths and power companies like to find things to do with their excess capacity. In the case of the Dead Sea in Israel, you have both the electricity and the most amenable source of magnesium suspended in solution up to 25% of the water volume, the highest on the planet. That's where Segal source their pure magnesium with the clever alloying production taking place somewhere else that it doesn't want to tell us about. Nothing has been so mysterious since the first Russian Cold War titanium started to be sneaked out from behind the Iron Curtain. Lately, and before we saw Segal's welded tubular frames, one of our favourite engineers Bill Shook from American Classic has been extolling the lightweight benefits of magnesium in his wheel rims for a couple of years right up until the Eurobike Demo Day where he showed us the latest version of his Mag wheelsets weighing in at an ethereal 1,108 grams per pair. Segal have no UK distribution or dealers yet but we expect that will change quickly if the buzz created at Eurobike is anything to go by. Watch this space.